LFG’s Land Access Project Phase 2 (LAP2) brought together over 40 partner organizations, agencies and individual experts for a three-year regional collaboration. LAP2 wraps up this summer. Together we have developed and strengthened programs, services and policies, improved professional networks in each state, our region and nationally. LAP2 also investigated innovative land access and transfer tools and methods. Nationally, there are over 60 self-identified farm link programs! Here in New England, as part of the LAP Linking Task Force, four organizations with successful farm linking initiatives formed the New England Farm Link Collaborative. Connecticut Farm Link, Maine Farm Link, Vermont Land Link and Land For Good worked together to upgrade and manage the New England Farmland Finder website. They also conducted user surveys and examined user data toward improving and coordinating sites and programs. A new online programs guide helps users see what services are available through which programs. Task Force members observed that many landowner postings don’t describe the property or convey the opportunity as effectively as they could. So, the Collaborative designed a property posting guide that walks landowners through a typical farm link application with abundant tips for how to best convey their information. Special appreciation to Ben Waterman, at the UVM Center for Sustainable Agriculture. As Task Force leader, Ben was meticulous in managing all the intricacies of website upgrades and techno-troubleshooting, resulting in a much-improved site. In fact, at least three other programs nationally have replicated the NEFF model. Ben’s tenure as the Task Force Leader ended in August, with an admirable list of accomplishments. Thanks to Ben and Linda Berlin, the Center’s director. Urban Land Access for Commercial Farming: Despite increasing interest in urban agriculture, little exists to help farmers navigate access to land in urban settings. Jo Rosen of Equity Trust and Kathy Ruhf co-authored a guide that addresses urban land access for commercial farmers. The guide looks at the unique challenges in locating urban properties, and dealing with urban ordinances, soil issues, and landowners, for example. Innovative urban tenure arrangements are featured. Task Force leader, Bob Wagner, and LFG Rhode Island Field Agent and urban farmer, Tess Brown-Lavoie, contributed to the guide which will also appear as an article in the upcoming issue of NOFA’S The Natural Farmer. The guide will be available in LFG’s farm seeker toolbox this spring. Farmland Tenure Methods: Task Force leader, Bob Wagner, and Kathy Ruhf are putting the finishing touches on a Farmland Tenure Methods guide accompanied by a decision tool. 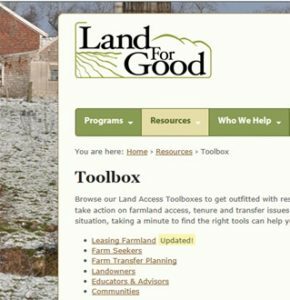 The guide and tool will help farmers sort through their land access options and make informed decisions. The methods are organized in three “buckets” based on the farmer’s goal: ownership now; path to ownership; and non-ownership (tenancy). The guide explores the partners and stakeholders, legal and financial arrangements, equity and legacy provisions, challenges and responsibilities, and advantages and disadvantages of each method. Included is a comparison of methods across several variables such as affordability, flexibility, security and equity. The decision tree graphically complements the written guide. Thanks to Task Force members who contributed to this guide, and to guide reviewers. Would you like to review the final draft? Contact Kathy at kathy@landforgood.org. Training for Farm Succession Advisors offered skill building to over 60 attorneys and other farm service providers. Succession advisor desk reference: At a two-day professional training for farm succession advisors, over 60 participants shared their expertise this past May. The rich materials developed for the training form the core of a desk reference for attorneys and other farm service providers. Detailed enough for lawyers, and broad enough for the rest of us, this online compendium will be an essential part of any succession planning advisor’s library. Interested? Email Annette Higby annette.higby@comcast.net for info. 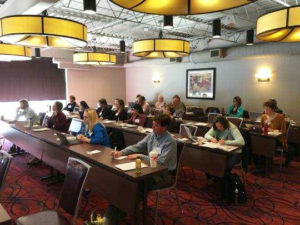 Succession advisor desk reference: At last May’s two-day professional training, over 60 participants shared their expertise. The rich materials they prepared for the training are being transformed into a desk reference for attorneys and other farm service providers. Detailed enough for lawyers, and broad enough for the rest of us, this online compendium will be an essential part of any succession planning advisor’s library. Watch for the reference coming out this spring. Farm transfer resources: Anyone with a website knows that updating it is an ongoing task. This is especially true when resources and provider networks are rapidly expanding. Such is the case with farm transfer. We’re updating the resources and providers on the Farm Transfer Network of New England and adding new materials. Do you have any to recommend? And we’re always recruiting new providers. If you offer farm transfer services-legal, financial, conservation, management, insurance, or other, let farm families and other providers know about you! Sign up here.